A more reactive metal will displace a less reactive metal. In addition a more reactive metal will react more vigorously than a less reactive metal. Iron rusts when oxygen and water are present. Oxidation is the loss of electrons. For example a sodium atom (Na) loses an electron to become a sodium ion (Na⁺). Another example is a chloride ion (Cl⁻) losing an electron to become a chlorine atom (Cl). Another definition of oxidation is the gain of oxygen. For example if carbon combines with oxygen to form carbon dioxide, the carbon is being oxidised. Reduction is the gain of electrons. For example a sodium ion (Na⁺) gains an electron to become a sodium ion (Na). Another example is a chlorine atom (Cl) gaining an electron to become a chloride atom (Cl⁻). Another definition of reduction is the loss of oxygen. For example when aluminium oxide is broken down to produce aluminium and oxygen, the aluminium is being reduced. 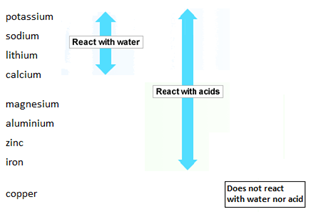 Redox: A reaction involving oxidation and reduction. 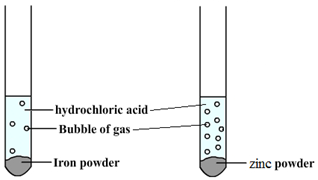 Oxidising agent: A substance that gives oxygen or removes electrons (it is itself reduced). Reducing agent: A substance that takes oxygen or gives electrons (it is itself oxidised).